Do you need a fun and worthwhile summer project? Friends of Special Education Foundation and Special School District employees are creating weighted blankets for children with autism. Some people with autism find comfort and security with the use of these blankets. Blankets are made to certain specifications. They should weigh about 10 percent plus one pound of the child’s weight. They should never be used during sleep or on an infant. The blankets may be placed over the shoulders, across the lap or on chest and stomach. It is entirely up to the child which placement is most comforting. And the blankets are completely washable. A number of teachers have requested a blanket for their classrooms. Teachers may contact me to be added to the list, however, we need more seamstresses as well as cute, washable fabric. Tammy Gruenninger (SSD warehouse) and her mother, Lorie, are sewing blankets. Jim and Barb Kick generously donated the expensive, hard to find plastic pellets. If anyone is looking for a worthwhile summer project please contact me, Patty Benner, at 314-825-1714 or psbenner@ssdmo.org. Also contact me to put your name on the list for a blanket or to donate fabric. 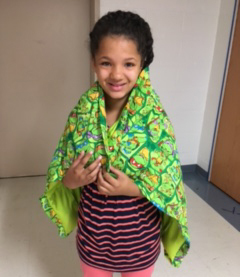 Project Hug has now provided over 500 weighted blankets to children with conditions like anxiety and autism. In 2019, Project Hug was awarded SSD’s Special Ambassador Award, an honor presented to organizations and community members who demonstrate an extraordinary commitment to SSD’s students and staff.